Hummus = YUMmus. And while I am a big fan of the Sabra brand, I am a bigger fan of making it myself especially when I learned how incredibly easy it is to make delicious, fresh hummus at home. Now, I do love the hummus but prefer the hummus with a twist over plain or garlic. I whipped these up for a party recently and loved. every. bite. I have made hummus many times in the past but opted to make it without tahini. Tahini paste is the thick and sticky substance that takes your creation from garbanzo bean dip to creamy sensational hummus. Don't know tahini? Check at Whole Foods or Trader Joe's. It has the consistency of peanut butter and is almost a pale gray color. Guess what? Don't have tahini? Or Whole Foods? Or Trader Joe's? Use creamy peanut butter. Yes. I said it. It has a slightly different taste in the final product but it is an easy and silent partner when you are in the hummus making mood. From my kitchen to yours, enjoy every bite. When you drain the beans, reserve the liquid as I mentioned. You can use some of this liquid to reduce the amount of olive oil you need. 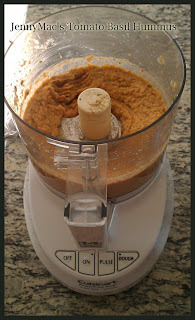 Place beans and tahini paste in the food processor and pulse 10 times to break down the beans. Add reserved liquid a small amount at a time until consistency of beans becomes smoother. Add jalapeno and cilantro (you can do a rough chop on both but not necessary if you are using a blade in your processor.) Taste. Add salt. Important to taste before salting always! You can add additional salt if you like. Turn processor on and slowly pour in olive oil until desired consitency and smoothness is reached. Dig in. Try to share some. Now, for a little more Italian flair, use the exact same process replacing the jalapeno and cilantro with handful of fresh basil and 1 medium sized tomato. For mine, I used basil olive oil as well. Delicious. 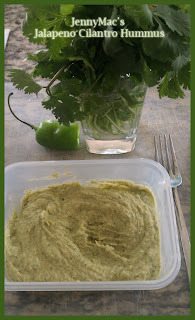 I love love hummus as well and what great variations... I'm a big fan of a lot of lemon. As much as I live on peanut butter I can't imagine it in hummus...I might have to try a small batch. The hummus sounds good will try it. Am thinking that Tahini is a nut paste, too, so it makes sense that PB would work. If you used one without a lot of added sugar or salt, it would be a close cousin... I think. that looks DIVINE. Seriously. I'm starving right now! Thanks for the silent partner tip, I will definitely be trying this out! Love hummus! I will have to try these out soon! Thanks JennyMac!